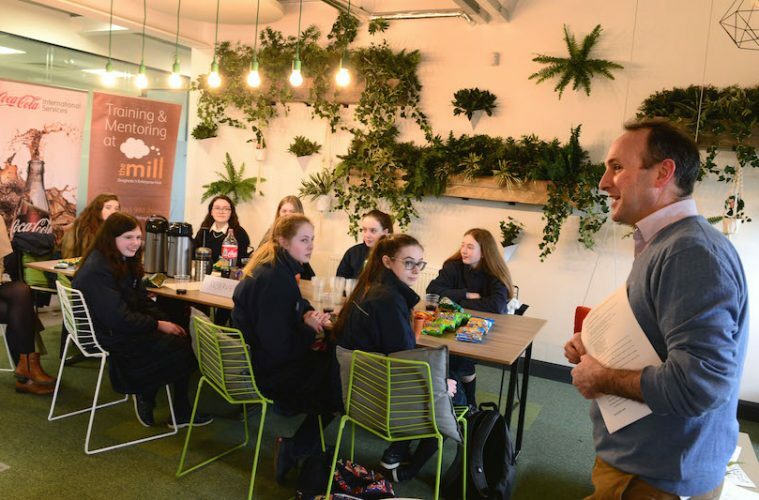 Breanndan Casey, Business Development Manager at The Mill ñ Droghedaís Enterprise Hub speaking at the Launch of the Drogheda Young Innovators Programme, 2018. Photo: Andy Spearman. Students in nine Drogheda-based secondary schools (including Dunleer and Laytown) will have a chance to put their innovation skills to the test and win the 2018 Drogheda Young Innovator competition. Now in it’s 4th year, the 2018 DYI competition was launched on Thursday February 8th, in The Mill Enterprise Centre. The competition is now firmly placed in the curriculum of local schools, and previous winners have already represented Ireland at International competitions, spoken at TedXDrogheda, and sold their products around the globe. Local students have until March 16th to submit a short application in one of the three categories. There are 3 main categories – Science / Technology, Enterprise / Business, and Social Enterprise. There will be cash prizes for group and individuals in each category, and one overall winner. Applications for the Young Scientist and the Student Enterprise competition will be eligible to apply. This year, the school that produces the overall winner will also receive a free STEM workshop from www.Bricks4Kids.ie. Short-listed applicants will attend a workshop on April 11th at The Mill Enterprise Hub, where they can get real time feedback on their projects from the judges and other students. The final will take place at Coca Cola’s Southgate office in May. Blathnaid Murphy from Our Lady’s College in Greenhills scooped the top award in 2017, when she impressed judges with her business, “Daisy’s Pawsome Bowties”. Blathnaid, at twelve years of age, was the youngest winner of the DYI competition. She continued her proud success by winning the Junior category at the National Student Enterprise Awards competition organised by the network of Local Enterprise Offices (LEOs) in Ireland. Further details and application form are available on www.droghedayounginnovators.com.